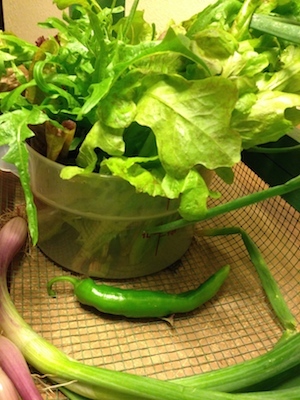 Picked the most of the garden lettuce today, and thinned more green onions. Organic, French Red Leaf lettuce, “Redina”* Big beautiful rosettes of ruffled red leaves Tasty, eye-catching and disease-resistant French lettuce is lasting a couple of weeks longer than most. Heirloom leaf lettuce “Garden Ferns,”* Sweet flavored, long lance shaped leaves with juicy texture. Perfect shape to mix with other lettuces in mixed spring greens. These tender leaf lettuces are best with the lightest of dressings. Choose fresh lemon juice or herb vinegar to combine with olive oil. Dressing: 2 parts lemon juice (or herb vinegar) and 1 part olive oil. Spring greens mixed with onions and radishes. Acid – Choose fresh squeezed lemon juice, or white wine vinegar. Make this you secret recipe with a herb flavored vinegar, like chives or tarragon vinegar. Try rice wine vinegar. Oil – Olive oil is the classic choice. Add a couple of drops of sesame. This oil must be stored in the refrigerator. 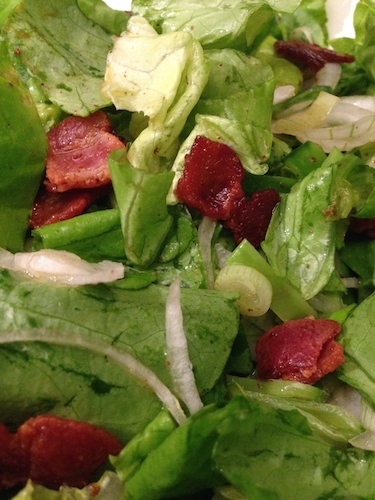 Using bacon drippings will make a wilted lettuce or a hot bacon dressing. Bring a bucket of cold water to the garden. 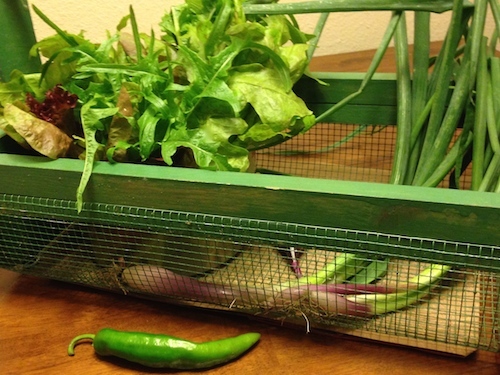 Cool Idea: Bring a bucket of iced water to the garden when you pick lettuces. Warm days tend to wilt lettuce, spinach, chard. As the weather heats up, lettuces will bolt, or go to seed. Complete the circle: If your lettuce is an heirloom, let some of the lettuce go to seed. Collect a few seed and plant them next spring.